Has it really come to this? Have the forces of political correctness so taken over that we can’t even discuss the topic of race in this country without being labeled racist? You may have heard of the controversy created when Golf Channel anchor Kelly Tilghman, in a moment of breathtaking stupidity, said that the only way to beat Tiger Woods would be to “lynch him in a back alley”, a comment which practically had co-host Nick Faldo scrambling for a crowbar to help her get her foot out of her mouth. Nice going, Kelly. Given the number of black men who really have been lynched in back alleys, the remark was profoundly stupid, insensitive, and unfunny. Not surprisingly, this caused a major uproar. Al Sharpton, the man who has never met a television camera he didn’t like, predictably called for her firing. Interestingly, Tiger Woods himself, acting with characteristic maturity, downplayed the whole incident, and accepted Tilghman’s apology. Tilghman was suspended for two weeks. Enter Golfweek Magazine. 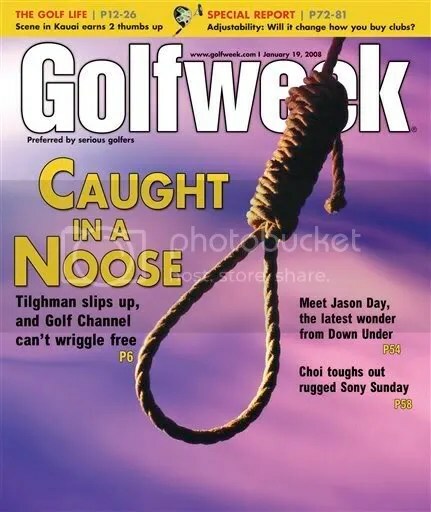 Again not surprisingly, they ran an article on the whole sorry affair, and the cover of that issue (pictured above) featured a startling image of a noose. This caused even more of an outcry than the story it was covering. Faced with (what else?) the threat of advertisers walking out the door, Golfweek fired editor David Seanor. Am I the only one who sees a certain irony in all of this? Kelly Tilghman makes a stupid, racially insensitive remark, and gets off with a slap on the wrist. David Seanor attempts to examine not only this incident but also the larger issue of race as it relates to this overwhelmingly white sport, and he loses his job. Now before you start sending me the hate mail, let me make something perfectly clear. Blacks have gotten screwed in this country for hundreds of years. The way blacks have been treated in this country is an evil blot on our history. Whites, at least some of them, have much to answer for. But what is so very troubling about this is how when the subject of race rears its ugly head, rationality seems to be the first victim. Seanor’s heart was, from all accounts, in the right place. Golf is just about the most lily white sport there is–to this day there are country clubs which don‘t allow blacks–and this incident provided an admirable place to examine this issue. What we have here is a classic case of shooting the messenger. Was David Seanor being provocative? Sure he was, but last time I checked, that’s what editors are supposed to be. Even if he did cross the line, what was warranted, at most, was an apology, and frankly, I don’t think he has anything to apologize for. As editor, his job is to intrigue the reader, make you want to read the article, and hopefully, make you think. This has not happened here. Indeed, people seem to have stopped thinking. Sadly, it seems as though everyone is too busy focusing on the cover to actually read the article. Had they done so, they would have read a thoughtful exposition of not only the controversy in question, but of the issue of race in golf in general. But even more troubling is how the notion of freedom of speech is being subverted by political correctness, which is in reality nothing less odious than censorship masquerading as benevolence. If the concept of freedom speech is to have any validity, then it must apply to everyone, not just to those who are saying what you want to hear. Not everything that is said is going to be intelligent, or kind. But the price you pay for being able to say or write what you want, is that you have to put up with everyone else saying and writing what they want. As I read this story, all I could think of was the stories of David Howard, a Washington, D. C. mayoral staffer, and Stephanie Bell, a fourth grade teacher from Wilmington, NC, who both got themselves into hot water for using the word “niggardly“, a word which has absolutely no racial connotations except to the uneducated and hyper-politically correct. David Howard lost his job. Stephanie Bell was ordered to write a written apology and attend sensitivity training! This is what happens when political correctness replaces factual discourse. As a strange little sequel to all this, I read in the paper yesterday that, when asked if Bill Clinton was the “first black president”, Barak Obama stated that he would have to “investigate [Clinton’s] dancing ability” before he could “accurately judge whether [Clinton] was in fact a brother”. So, like any good American, I checked out the video. The audience laughed. Hillary laughed. I laughed. John Edwards looked extremely uncomfortable, as well he should have. He knows damn well that if he had been that “witty” he’d be out of the race by now. You can check out the video here. What is happening in this country is that this most cherished of our freedoms is being eroded by the twin forces of political correctness and advertising dollars. What Kelly Tilghman said was stupid, but she did not deserve to lose her job. In fact, it seems as though the Golf Channel wasn’t going to punish her at all until it was pressured by advertisers, resulting in her two week suspension. Is it fair that David Seanor, whose only crime was a desire to report the incident and create dialogue, should suffer a worse fate than Kelly Tilghman? I think not. It bodes ill for us all if we cannot even discuss the issue of race in this country without being labeled racist.